Due to poor control and chlorination in the shore facilities / ports and also in the ship network (including fresh water tank), the fresh water supplied on-board is not suitable for human use and consumption in many cases. 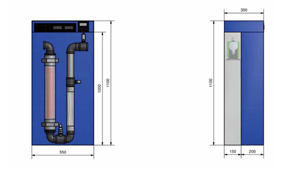 ALIOS CHLOR is a fresh water disinfection unit in compliance with MLC Legislation. It ensures access to excellent quality of drinking water. ALIOS CHLOR unit is coming to substitute the costly dosing of sodium Hypochlorite or UV lamps disinfection. In process of electrolysis the system produces chlorine to disinfect fresh water from shore bunkering or freshwater generators (evaporator or reverse osmosis units). This ensures a safe and constant amount of disinfectants. According to MLC legislation, water intended for human consumption must be free of microorganisms and parasites. Such substances in numbers or concentrations constitute a potential danger to human health. The supply and use of fresh water is essential. Contaminated water can spread serious diseases to human organism such as typhoid fever, dysentery and cholera.